More info:Single supplement from $1735 - $2315. Offers:Up to US $670 off selected dates. Traveling on a small ship and being that much closer to the water, you can’t help but notice how plastic rubbish is collecting in our seas and oceans. To do our small part, we have worked to eradicate single use plastics on board our voyages. All our boats have water refilling stations and all guests are provided with an aluminum water bottle upon boarding to encourage them to use it. We use no plastic cutlery or cups and straws are not offered in drinks. Breakfast tends to be the meal that plastics can creep into so we ensure that butter, jam and yoghurts are bought in bulk quantities to avoid individually wrapped or packaged items. In our cabins, provided toiletries are in pump dispensers, not plastic bottles and we try to limit the amount of printing we do to avoid excess paper usage. We ask our chefs to be mindful of packaging when purchasing at local markets during the voyage and will continue to work with our bulk suppliers to limit any form of plastic that comes on board. Our tour leaders encourage clients to be mindful of packaging as they are making purchases during the voyage. All our adventure cruise passengers are provided with an Aluminium water bottle at the start of their voyage. Our tour leaders are 100% behind our company’s initiatives to prevent more plastic waste entering our oceans. They will work to educate our clients on what they can also do help and to make good choices while they travel. At the same time, we are working with our suppliers to also educate them on what they can do to improve their operations. Responsible travel is one of the pillars our company is built upon. All of our travelers are provided with information regarding Responsible Travel at all stages of the booking process and while traveling with us. Our leaders are also trained extensively in Responsible Travel and will advocate for this throughout our trips. Traveling by small ship has a much lower impact on the environment and specifically, on the towns and rural areas that we visit. Croatia is experiencing a tourism boom, therefore by traveling off the roads, we are not impacting the local communities and countryside in the same way that large scale coach touring may. Rubbish is segregated on board in food waste, paper, plastic, aluminium and glass. After, they are given to shore facilities where available. There is also a sewage treatment plant on board. Every passenger receives a water bottle to reduce plastic cups. In addition to water bottles the ships are equipped with FW evaporators (reverse osmosis systems) that produce fresh-potable water that is triple filtered. Bio-degradable soaps are being used on our ships. We also follow the eco-friendly system for towels due to the amount of water used to wash towels that have only been used once is overwhelming. If passengers are happy to reuse their towel for another night they hang it up, if they would like to replace it stays on the floor. Compared to large ship, all-inclusive touring, small ship cruising gives many more opportunities for our clients’ money to be spent in local communities. We don’t include all meals so there will be opportunities on most days for passengers to experience local cuisine and dine in local establishments. Our leaders are local so will be able to make recommendations spreading the business around in any town we visit at meal times. For example, on Day 4 we will On Day 6 in particular, we’ll visit Opuzen where we will go to a beautiful local restaurant overlooking the water for Peka lamb and other local dishes. 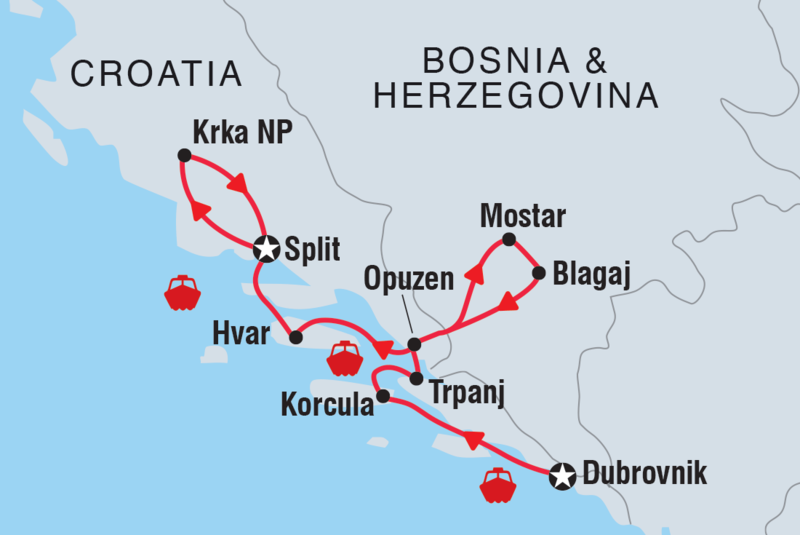 We have a Destination Management Company in Croatia to manage our touring operations in the country. The DMC will employ local people and will allow us to ensure that our responsible tourism standards and philosophy is upheld in Iceland. The company is following the International Labour Organisation (ILO) guidelines and fully Maritime Labour Convention (MLC) compliant whereas the rights of the seafarers are safeguarded. There is no discrimination on the gender of the seafarers and best candidate is being employed in each position.